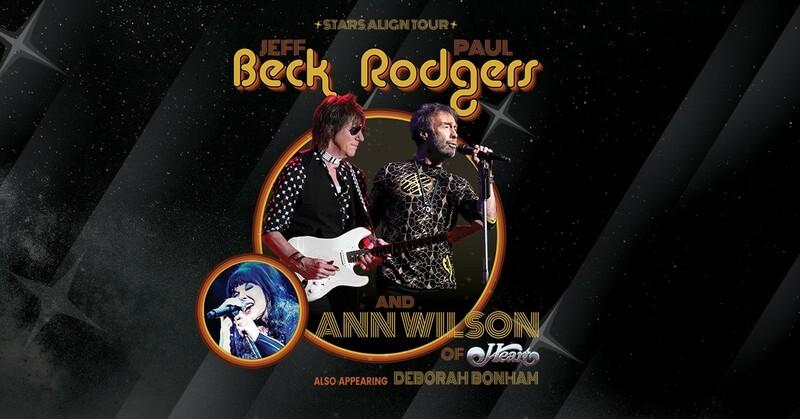 Los Angeles, CA (January 30, 2018) – Today, iconic legendary rock musicians Jeff Beck and Paul Rodgers announced they will join forces for the “Stars Align Tour,” their co-headlining summer outing with Ann Wilson of Heart. Produced by Live Nation, the outing kicks off July 18 th in West Valley City, Utah, and will stop in cities across the U.S. and Canada including Los Angeles, Dallas, St. Louis, Chicago, Toronto, Tampa, and more. The full listing of tour dates can be found below. Tickets will go on sale to the general public for the “Stars Align Tour” beginning Friday, February 2 at 10 AM through LiveNation.com. Citi® is the official presale credit card for the tour. As such, Citi® cardmembers will have access to purchase U.S. presale tickets beginning Wednesday, January 31 at 12:00pm local time until Thursday, February 1 at 10:00pm local time through Citi’s Private Pass® program. For complete presale details visit www.citiprivatepass.com . Singer, songwriter and multi-instrumentalist, Paul Rodgers has led 3 bands to global success: Free, Bad Company, & The Firm. Rodgers has been named the #3 “Greatest Voice in Rock” in Rolling Stone and the #2 “All Time Best Rock Singer” in Classic Rock Magazine. For his songwriting, he was awarded the prestigious Ivor Novello Award along with John Lennon, Paul McCartney and Elton John. 2018 celebrates his 50 th anniversary as a recording artist who has sold 125 million records. For the first time in 50 years in North America Paul’s set will focus on his Free catalogue. Live Nation Entertainment (NYSE: LYV) is the world’s leading live entertainment company comprised of global market leaders: Ticketmaster, Live Nation Concerts, and Live Nation Media & Sponsorship. For additional information, visit www.livenationentertainment.com .